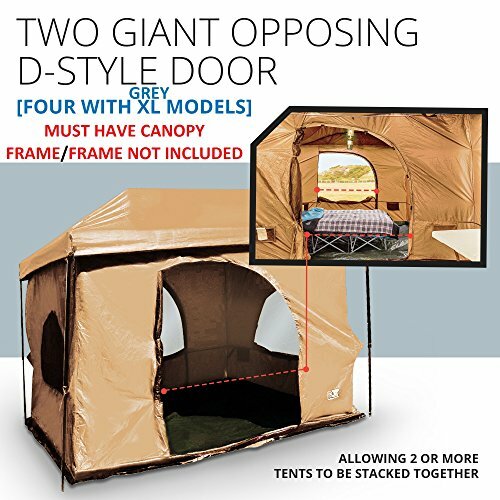 This ORIGINAL DESIGN TENT features 8.5 FEET OF HEAD ROOM (Able To Stand Up, Walk Around and Strtch Oeut, Even In The Corners) FULL WATERPROOF FABRIC CEILING (NOT CHEAP SIEVE SCREEN) GUARANTEED TO STAY DRY, FULL "TUB STYLE" Floor Nearly any 10'x10' (straight leg) canopy or gazebo with a vaulted ceiling can be used as a cover and the support for this tent. 100% SATISFACTION GUARANTEED - We are so confident that you will LOVE OUR STANDING ROOM TENT WE OFFER A FREE 30 DAY MONEY BACK GUARANTEE!. Try it, we know you will LOVE it! If you have any questions about this product by Standing Room Tents, contact us by completing and submitting the form below. If you are looking for a specif part number, please include it with your message.